I apologize, friends, for my radio silence. I just spent two weeks working in our nation’s capital. I recently accepted a new Reserve job at the Pentagon, which necessitates traveling to DC twice a year for two-weeks a pop. This was my first time out, and I have to admit, I had a great time. Unfortunately, I didn’t have enough energy to update the blog during that time. And our process has stalled out a bit, so I think I was feeling a little discontent. A two-week break from everything is exactly what I needed. I also think, even though I promised myself I wouldn’t, I started worrying about writing my blog posts in the exact right way, and making sure people liked them. But that’s not the point of this blog, and not why I started it in the first place (not to mention ain’t nobody got time for that), so hopefully I’m back to just sharing what’s on my mind. Which is a lot, according to my new Air Force colleagues, ha ha. I just learned (after 34 years!) that I apparently narrate my entire life, which isn’t always awesome for those around me. One guy told me (and don’t blame him, poor dude had to work with me on everything for two straight weeks), “You don’t just wear your heart on your sleeve, your whole soul just oozes out of you.“ 🙂 So, there’s that. At least here on my blog, you have a choice about listening! Consider yourselves lucky! (And warned). One of my favorite things to do in DC was ride the metro. I feel so grown-up when I ride the Metro. Being responsible for two tiny humans completely dependent on me doesn’t do it, but when I ride the Metro, I feel like I’ve arrived. I also had the opportunity to catch up with a lot of old friends, which I really enjoyed. I appreciated the chance to re-connect, especially in our busy lives when there isn’t always time to slow down. But I also got an entire Saturday to myself. Did you hear me, people? An entire Saturday to myself! It was really exciting. So I rode the Metro (surprise!) down to the National Mall and wandered around aimlessly. I saw the Hubble 3-D Imax at the Air and Space Museum, and then the Jerusalem 3-D Imax at the Natural History Museum. Our world is honestly amazing, friends. I am in awe of its greatness. I took a pit stop in the Art Museum to recharge my phone (lost without GPS, sorry art lovers!) and then I headed toward the Washington Monument to find the Vietnam War Memorial. 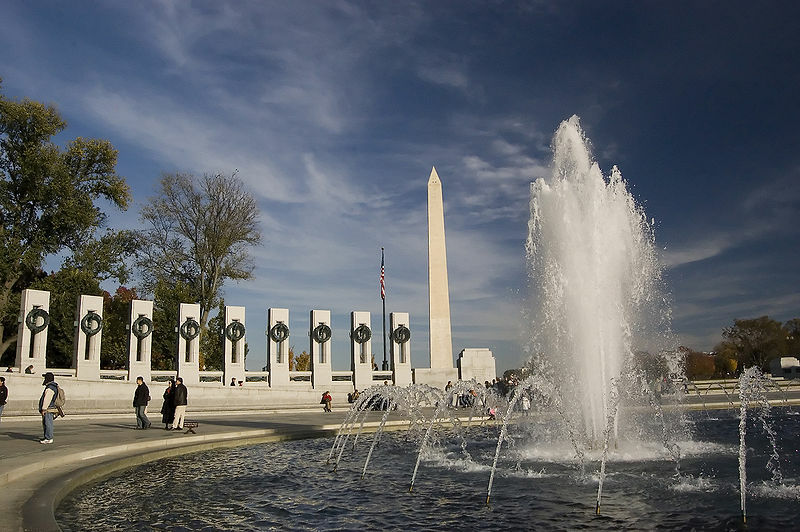 Instead, I stumbled upon the World War II Memorial, where a bagpipe band was performing in front of the fountains. I honestly don’t know why it made me so emotional, but as I walked around the memorial, my hand tracing state names and my eyes lingering on mementos and stories left behind, I started sobbing. The bagpipe band began playing Amazing Grace, and it was just. too. much. I stood, alone, in the middle of that memorial, frozen in time. Completely overwhelmed. I’m not sure with what…gratitude for the sacrifices of others, heartache for those who have lost, pride in our nation’s servicemen/women, awe of the legacy that generation left behind…it ALL just crashed over me. I stood there smiling and crying at the same time. Like a crazy person. The thing is, I honestly love the United States. I know we can be hot mess sometimes, and there is always room for improvement, but man alive, I believe in the heart of this nation. In her people, in her premise, in her promises. It’s why I still serve, and why I’m proud to be part of a family that serves. I secretly love Lee Greenwood’s God Bless the USA, and I can still remember wearing a gold ribbon on my overalls (only one strap connected!) at recess during Desert Storm. The colors of our flag entrance me, and I can’t hear The National Anthem without catching my breath (or wanting to yell, Go Birds!) for a second. So when I hear (or read this type of sentiment on the internet) the question, “Why would you adopt internationally when there are so many children who need homes here?,” I bristle a little. To be honest, it’s usually not said in a nice way. The subtle intimation that I am not patriotic, or that I am somehow letting this country down, is misplaced. It’s grossly presumptuous, and often ill-informed. I am so thankful for the many blessings (luxuries, really) that I have been afforded because I was born in the United States. But I don’t think I deserve them more than anyone else. And I just can’t buy into the idea that a child is more or less deserving of a family based on the borders into which he/she was born. More or less deserving of having their basic needs met…their thirst quenched, their hunger satisfied, their souls LOVED. I can’t. I won’t. And I don’t think Jesus does either. I AM called to love my neighbor. And I guess I can see trying to make a case for other Americans being my neighbor. But then there’s the story of the Good Samaritan (Luke 10: 25-37). Jesus talks about a man who was stripped, beaten and left for dead. A priest and a Levite passed by, but didn’t want to deal with the problem, so they actually crossed the road to get some distance from the man, and walked on. The priest and the Levite were his “neighbor” in the traditional sense. They were his people — he was one of their own. The Samartian then walked by and was moved with compassion for the stranger (as one could argue, ANYONE should have been). He treated his wounds, and took him to shelter, paying for his care. The man wasn’t one of the Samaritan’s people. And yet he saw a need, and he met it. Because he could. So, am I saying we shouldn’t do anything to help other Americans in need? Of course not. I think, as believers, we should always do what we can to ease the suffering of others. And there are obviously tons of ways to do that right in your own neighborhood. If you are ignoring the needs in your own backyard, and then traveling abroad to meet needs instead, maybe it’s worth examining your heart. But for me, choosing whose needs are worthy of meeting (or at least trying to meet them), is simply not dependent on what citizenship they hold. How could it be? I honestly don’t understand. Without a doubt, children without families in the US also deserve our attention, our heart, our resources. Foster care needs loving families to step up, and it’s possible that will be part of our story one day. It’s a beautiful story to be a part of. But it’s not ours, not right now. And I don’t think it helps anyone to pit needy children against one another, shifting blame and casting judgment. If your heart aches for these children, please consider turning that into action. Not everyone can (or should) adopt, but there are lots of other ways to be involved. I’m hoping to get it together enough to do a post on some easy ways to make a difference soon, as well as some basics on the reality of the global orphan crisis. In the meantime, you can read this post for some more thoughts on who deserves our aid, or check out these few posts (statistics, making sense of the numbers) for a little more general orphan info. Listen, I get that adopting one child isn’t solving any worldwide problems. I actually don’t think it’s my job heal the entire world…I don’t think I’m that important. But I think sometimes we can be so overwhelmed with the realization that we can’t fix everything, that we end up doing nothing. And nothing is never the answer. We have been called to do what we can, where we can. And we CAN bring our little Boo home, make him a part of our family, and love him forever. Ali, love your words of wisdom. You amaze me girl. I am so proud to have you as a daughter. Can’t wait to come see you and my grands! Amen and Amen! You speak my heart so clearly!